The SA Agulhas is a South African, ice-strengthened polar research/ supply vessel that was built by Mitsubishi Heavy Industries in Japan in 1977. 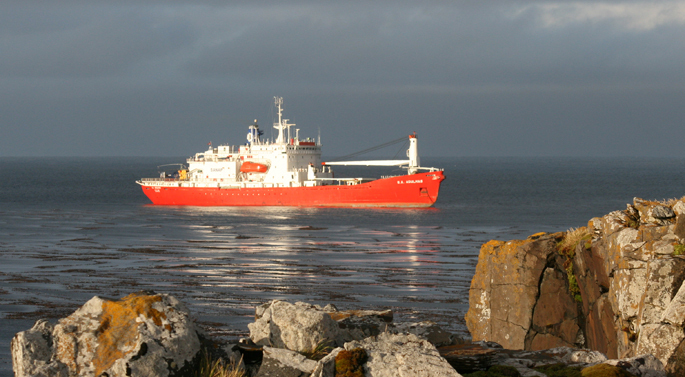 For over 30 years the ship has been used to service three South African research bases, on Marion Island, Gough Island and the Antarctic base SANAE IV.SA Agulhas weighs 6,123 tonnes and an overall length of 112 meters (367 feet). She is powered by two Mirrlees turbo-charged, intercooled, 6-cylinder, 4-stroke engines developing a total of 6,000 horsepower. She can cruise at 12.5 knots and has a range of 15,000 nautical miles and an endurance of up to 90 days at sea.The ship has accommodation for 44 crew members and up to 94 scientists, cadets and expedition members. 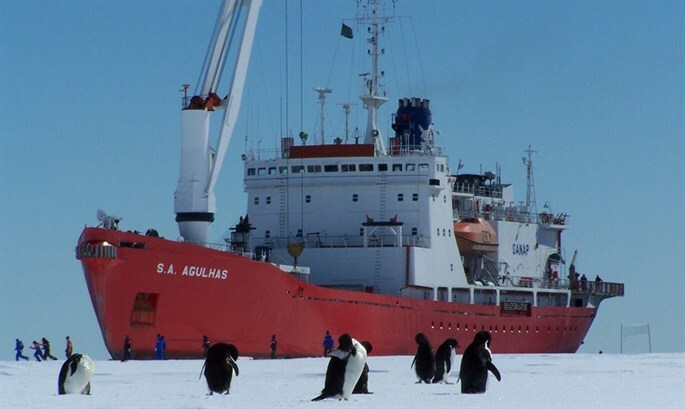 There is a doctor on board as well as a small, purpose-built hospital.With cargo holds of over 4,000 cubic meters (141,000 cubic feet) and a 17 meter, tonne crane, SA Agulhas has the capacity to accommodate the heavy expedition vehicles, equipment, stores and fuel. In addition to workboats and other small craft, the ship has a hangar and helipad for up to two Puma-sized helicopters. A number of laboratories and deck winches enable the ship to support a wide range of oceanographic, meteorological and marine biological research assignments and, on the bridge and in the radio room, the latest navigation and communications equipment are available. This includes a state-of-the-art global broadband maritime communications installation which will be used for satellite and wifi communications, and to stream film material back to the expedition HQ for press, media, education, science and sponsorship purposes. The helideck, hangar and public rooms on board SA Agulhas provide excellent spaces for functions and events when in port. At sea, it is proposed that, in addition to the science facilities, a small studio will be set up to prepare and film material for the education initiative, being pioneered by Durham Education Development Services. The expedition is indebted to SAMSA and Standard Chartered for the generous provision of this wonderful ship.